Maharaja of erstwhile-Travancore state inaugurates celebrations in Trivandrum, cites personal friendship with Svetoslav Roerich. 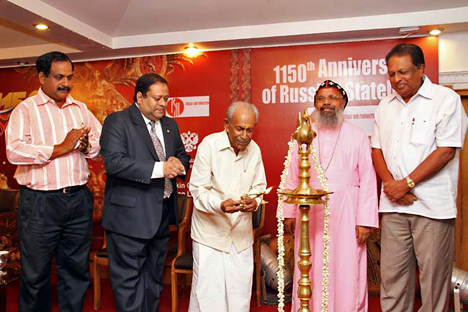 The 1150th anniversary of the establishment of the Russian state was celebrated in the tranquil Kerala capital Thiruvananthapuram or Trivandrum. The programme was organised by the city’s Russian Cultural Centre and the Pushkin Centre for Russian Language jointly with the Moscow based Russkiy Mir Foundation. The festivities, held at the Harmony Banquet Hall of Hotel Mascot, were inaugurated by Sree Padmanabha Dasa Uthradom Thirunal Marthanda Varma the Maharaja of the erstwhile princely state of Travancore. At the inauguration, 89-year old former ruler said that Russia will always remain a true friend of India. “Russia had a cordial relationship with Kerala especially the Travancore region. I myself felt the warmth of Russian people thanks to the affinity shown by Svetoslav Roerich. I am proud to say that he was one of my greatest foreign friends,” he said. Marthanda Varma also touched upon the roots of celebration. “1150 years back Rurik made an attempt to gather people belonging to different scattered tribal settlements near Veliky Novogorod. This resulted in the formation of a Great Kingdom named Russia,” he said. “Russia became a great country with different languages and cultures, united under one roof. Celebrating the 1150th anniversary of the Russian Statehood all over the world, especially in Russia, underlines this facts,” said the Maharaja. Former Ambassador of India and permanent representative of India to the United Nations T.P.Sreenivasan delivered the keynote address. He stressed that Russians are proud of their history and culture and it is the main reason Russian Government gives priority to such celebrations. The Bishop of Malankara Orthodox Church Dr Gabriel Mar Gregarious said that the Russian Orthodox Church established Co-operation with the Kerala based Malankara Orthodox Church centuries back. The visit of the present Patriarch of the Russian Orthodox Church His Holiness Kirill to Kerala marked a milestone in Indo-Russian relations. Honorary Consul of the Russian Federation and Director of the Russian Cultural Centre in Trivandrum Ratheesh Nair presided over the function. Kerala has recently emerged as a major tourist destination for Russian tourists, who visit the state’s expansive coastline as well as traditional ayurvedic centres.